If you want to print credit memos in a batch in QuickBooks, you need to select the Print Later check box that appears on the Main tab of the Create Credit Memos/Refunds window. Selecting this check box tells QuickBooks to put a copy of the credit memo on a special credit memos to-be-printed list. Printing credit memos in a batch works similarly to printing invoices in a batch. Display the Create Credit Memos/Refunds window, click the down arrow next to the Print button, and select Batch from the drop-down list. The Create Credit Memos/Refunds window. 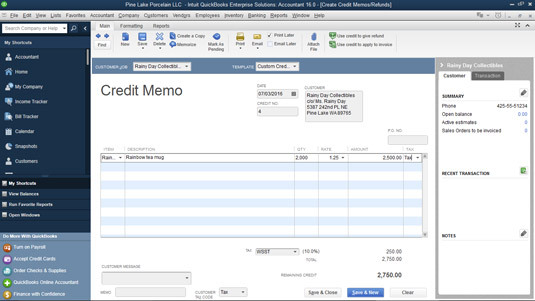 QuickBooks displays the Select Credit Memos to Print dialog box. Select the credit memos that you want to print. Click OK to display the Print Credit Memos dialog box. Use the Print Credit Memos dialog box to describe how you want your credit memos to be printed. Click the Print button to send the selected credit memos to the printer. QuickBooks prints the credit memos.